All of you certainly had to configure an RTC chip with the current date and time… today’s project can help to perform that task! GUI and sketch communicate through a serial connection, with a simple protocol. The source for both of them are available in my Github’s repository. In the image below the connection is made using the “new” I2C PINs of Arduino Uno; obviously you can still use the A4 and A5 PINs. For a detailed description of the connection and the use of the library, please refer to the official tutorial. 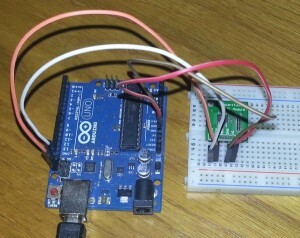 The Arduino’s sketch receives the commands from the PC, executes them and sends back a response. The first command sent after the connection is established, used by the PC to verify that a “compatible” device is connected to the serial port. Arduino must answer with !! This command is used to get the actual date and time, read from the RTC. 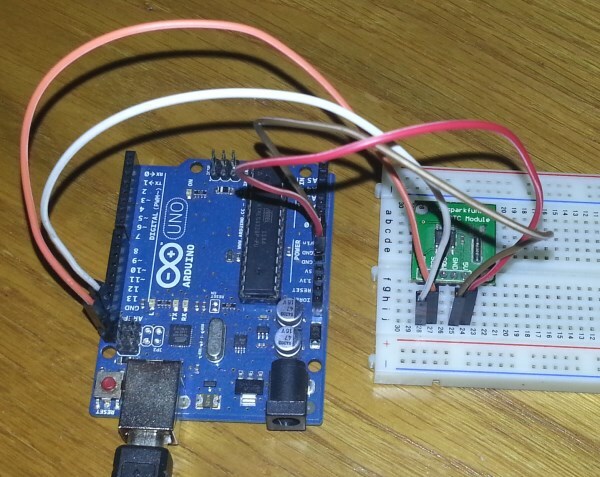 Arduino answers with a string in the format dd/MM/yyyy hh:mm:ss. 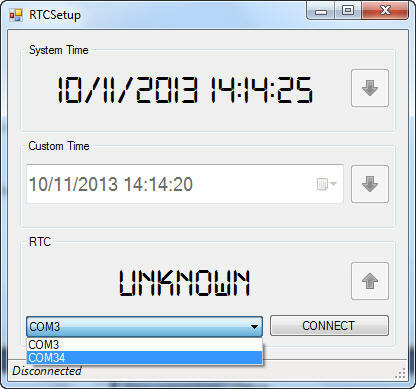 This command is used to set the RTC time. 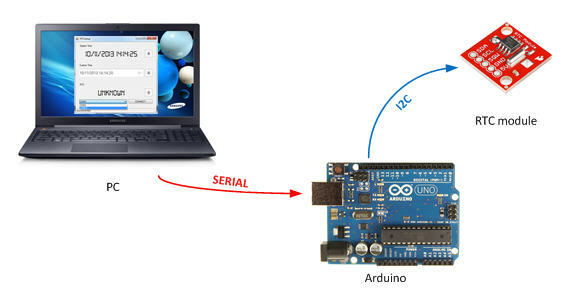 Arduino answers with OK.
First, you must choose the serial port Arduino is connected to and press CONNECT. If the connection is established (commands ## and ?V) the sketch’s version is displayed in the status bar. I used the method described in this tutorial to embed a custom font in the application. I measured the time (150ms) the sketch takes to set the time when the command is sent by the GUI: this is the reason why in the code you can see that the !T command is sent when the actual milliseconds are 850 and the time passed is the actual one + 1 second. You are the man! Been waiting for something simple like this for setting my rtc’s. Thanks again for sharing! 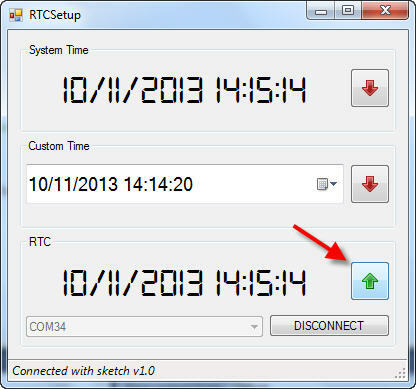 Where I can downloas RTCsetup GUI? Hi, thanks for sharing this nice project – very useful May I ask a question?…. I have updated the Arduino Sketch to use the RTC DS3231 which is very similar – the only difference is that ‘day’ in the DS1307 library becomes ‘date’ in the DS3231 library – all compiles fine but the computer end doesn’t successfully set the RTC desite reporting that it has done so – wondernig if there is anything I need to change in the VB code to get this working? Thanks. Hi! well… no if your sketch can correctly “parse” the string my app sends and set the fields in the RTC. I don’t have a DS3231, which library are you using on Arduino side? Hi Again, Whilst I havn’t got this working with the DS3231 yet I have got it working with the DS1307 – very nice. Hi, Thanks for the reply – the library I’m using is this one: https://gist.github.com/jeje/2021145 – it looks like the day of week element of this library might be tha main difference and is causing the problems? OK, it was the Day of Week element that was throwing things out – splicing a ‘0’ into the end of set_time solved that one :-)… would still be great to see RTC time update every second as per System Time…. how do we do that ? thanks for your great job. It works fine on 2 different Arduino Mega 2560. It doesn’t work on a Pro Micro with ATmega32U4. The ATmega32U4 features build-in USB functionality, instead a additional USB-Controller like the Mega. Is this already the problem or could it be with the serial buffer size? Hi JH, unfortunately I don’t have a Leonardo or similar to test the sketch at the moment… did you get any errors? Am I correct in thinking that this is windows only? I agree with Devin – this is so incredibly useful but I was forced onto Linux when Windows continued to crash regularly, even after a complete re-install. It might run under Wine I guess but, so far, I haven’t had a lot of success with that. Your ENC28J60 tutorial series is also proving to be incredibly helpful and, as far as I have got with it, everything has worked ‘straight out of the box’. thanks for your feedback! 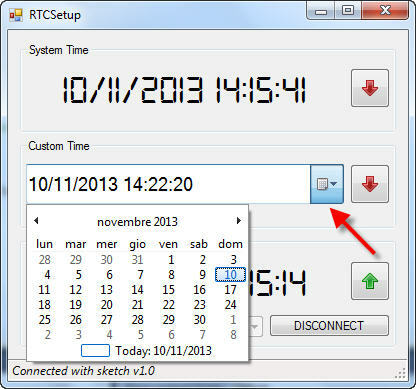 I developed the RTCSetup client using .Net, maybe you can run it on Linux using Mono. I’m going to develop my next projects using Java so they should be more portable on different OSes. I took a look at Mono but didn’t understand a word of it (in my 60s and no background in computing, but techie in the days of valves!). Could you add this to your list of Java projects – It really is an incredibly useful. If it could set all the RTCs on the network, using Ethernet or WiFi (it’s just easier sometimes if things have their own RTC to act at certain intervals) that would be a real killer, but I doubt it’s possible. Hola que tal. mira traté de correr tu boceto pero me marca un error donde dice que el RTC_sd1307 no tiene un miembro begin en la libreria.no eh podido corregirlo. Utilizo arduino uno. Hi! Did you install the RTClib from Adafruit? è possibile per far girare la una GUI in C# sul Mac? I installed the GUI and uploaded the sketch. The sketch works fine if i use the IDE terminal, it responds on all commands. 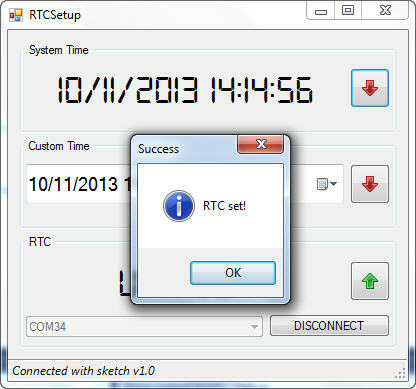 Using the GUI is gets the correct version (1.0) and the RTC time. But when i want to write the new time using the GUI it seems that GUI ‘hangs’. The mouse cursor keeps waiting for the program to finisch. Just wanted to say thanks for this. The clocks had changed and I needed to update the time and didn’t have the time myself. Downloaded this, changed to DS3231 and worked first time. il mio nome è angelo. ho realizzato il tuo rtcsetup mami sono accorto che manca del passaggio in automatico dell’ora legale/solare. come posso risolverlo? Ciao Angelo, purtroppo visto che la data di cambio ora varia ogni anno, l’unica possibilità è aggiungere qualche controllo manuale (pulsanti…) per cambiare l’ora manualmente. Can you make an adaptation of your setup program for the PCF8563 because I do not know the Visual C but I know how to program in Pascal Delphi is that the adaptation to this language is difficult? To help me, you can quote me the methods of dialogue between the RTC and your setup program in the program Source C.
Hi Mic, you have to change the Arduino sketch, the VisualC program only communicates with Arduino, it doesn’t know which RTC is connected. Ciao,stavo utilizzando questo tuo progetto ,ma quando imposto l’orario il tempo della conferma varia da 3 a minuti e il modulo rtc è di conseguenza sempre in ritardo,nvece quando richiedo l’ora è immediato. Utilizzo arduino uno R3 con il modulo tiny rtc v1.1 basato su ds1307. La cartella visual studio l’ho solo scompattata,non devo installare niente penso? Updated, simple improvements and fixed crash.